Find hotel near Arupadai Veedu Murugan Te .. Dedicated to the Tamil God Lord called Muruga, the Arupadai Veedu Temple is a place of worship of all the six veedus or holy homes. The six veedus Swamimalai, Thiruthani, Palani, Thirupparankunram, Pazhamudircholai, and Thiruchendur are of high significance religious for being mentioned Tamil sangam literature. The temple tranquil properties render calm like no other, making your visit highly satisfying. Given its god location, it can be easily accessed from anywhere in the city. To top it off, are the breath-taking views of the Bay of Bengal, you get to see from the temple. 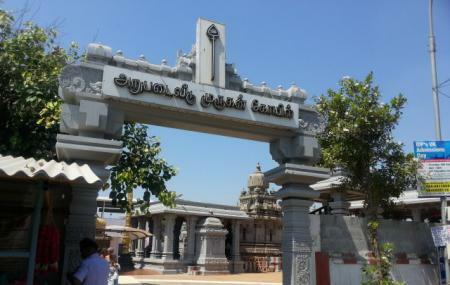 How popular is Arupadai Veedu Murugan Temple? People normally also visit The Forum Vijaya Mall while planning their trip to Arupadai Veedu Murugan Temple. Amazing initiative to bring all the 6 avatars of Lord Murugan in one place that too in a prime location of Chennai. Clean and well maintained. Unfortunately its not promoted well. Also the queue management during peak days are not done well, rather does not exist. But I won't blame only the Temple management for it. Overall awareness on customs and religion, knowledge on basic temple protocols and empathy/compassion for fellow devotees etc are largely lacking with the new generation so called Hindus, who turn up to temples only on Festivals and Blue moon days. These are the most vulnerable easy flock of targets for conversion by other commercial religions and vultures. Good place to visit when you're free. Has a nice view of the sea if it matters. Place is well built and good for taking photos. It is also easily accessible and is open most of the day. There are 7 important popular temples of Lord Muruga. This place represents him in those 7 places. Being, located beside the beach it refreshes your mind and sends you off with a mental peace. Located in Besant Nagar, Chennai in a calm and idyllic environment. This temple has the replica of all six Lord Murugan temple found all over Tamil Nadu. Well maintained and beautiful temple. The approach road is wide and can accommodate cars and two wheeler. Located in serene surroundings just by the sea this temple provides all the calm and quiet that you come in search for. Beautiful deities sculpted just as they are in the arupadai temples of lord Murugan. The temple premises are neat and well maintained.